The work of Tamás Kaszás has social, ecological and political dimensions; it combines a distrust of state authority and control with an optimistic rejection of cynical thinking. 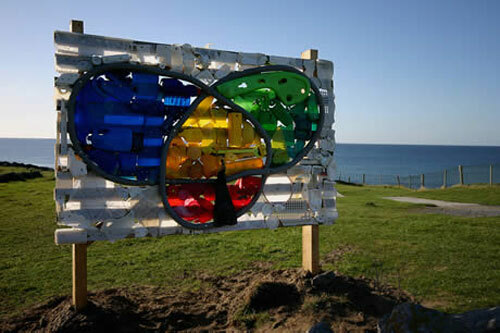 He creates complex environments that function as symbolic spaces where ‘free’ thinking and discussion can take place. His work for Rural Vernacular Seashore Reliefs is located on the edge of 5 beaches, areas that at first seem remote and pristine. 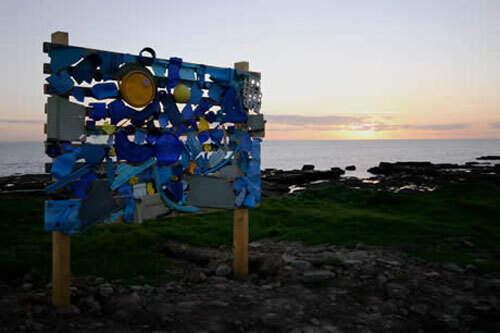 Kaszás has, however, spent weeks collecting plastic debris that has washed up all along this beautiful coast and has arranged it to resemble the kind of colourful signs that are so much a part of our visual culture. ‘Boards often control our behaviour’ says the artist. “They are carriers of clear, unchallengable messages that treat the members of society as kids with taking away the possibility of making a decision. 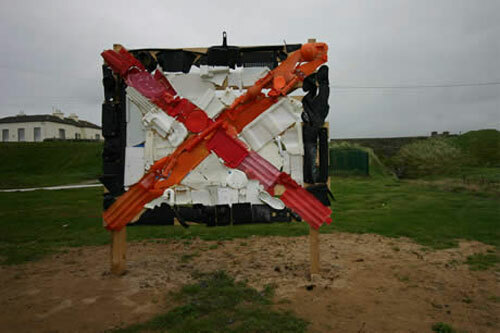 The alternative (signposts) boards are easy to be understood; they draw people’s attention to the pollution of the environment but don’t operate with the didactic statement. At the same time as drawing our attention to the use of the oceans as dumping grounds, this work focuses our attention on a material with which we all have a complex relationship. The artist says “I want to collect and use only plastic pieces in my work, because first of all, plastic is not regarded as a nice, soft material; however some of the pieces that were abraded and polished by the sea like gravel have surprisingly beautiful forms. Second of all, plastic is connected to many layers of meaning; it is made from oil, the residue of ancient seas and also the most important fuel of modern economy for which many wars have been started. Plastic is also the material of eternity; it decays very slowly – if ever.